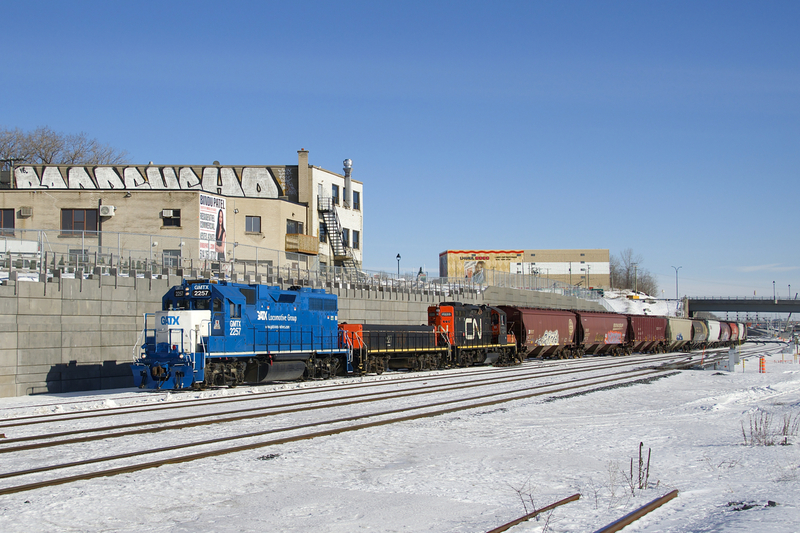 Railpictures.ca - Michael Berry Photo: The Pointe St-Charles Switcher has left its namesake yard with empty grain cars destined for Taschereau Yard as it heads west on the transfer track of CN’s Montreal Sub with leased GMTX 2257 leading and CN 227 and CN 7233 trailing. Up until the end of last summer the tracks curved off to the right here, but they now curve off to the left since a new right-of-way entered service then. | Railpictures.ca – Canadian Railway Photography – photographie ferroviaire Canadienne. Caption: The Pointe St-Charles Switcher has left its namesake yard with empty grain cars destined for Taschereau Yard as it heads west on the transfer track of CN's Montreal Sub with leased GMTX 2257 leading and CN 227 and CN 7233 trailing. Up until the end of last summer the tracks curved off to the right here, but they now curve off to the left since a new right-of-way entered service then.